Barley is a versatile grain with a nutty flavor and chewy consistency. Traditionally it is also called as Jao. The glycemic index of raw barley is 25 which makes it a low glycemic index range cereal. It has proven effect on reducing the problems of osteoporosis which is due to altered bone quality. Also helps in reducing the symptoms of high blood pressure such as weakness, fatigues, tiredness, vomiting, etc. Is Barley safe for diabetics? Since the glycemic load of raw barley is just 5.2 for 30 grams, it is safe for diabetics to have because barley comprises of complex carbohydrates of around 20.8 grams which takes time to release into the bloodstream. Thus manages your blood glucose levels. It also contains fair amount of proteins which when combined with a pulse makes a complete protein like a barley khichdi. This helps in making you feel satiated. It also helps in improving your cholesterol levels and lower your risk of heart diseases. Is Barley suitable for weight loss? A healthy diet and regular physical activity makes a lot of difference in your weight loss regime. Since this cereal has almost negligible amount of fat which allows you to have barley in the form of soup, khichdi, etc. without any guilt of extra calories. 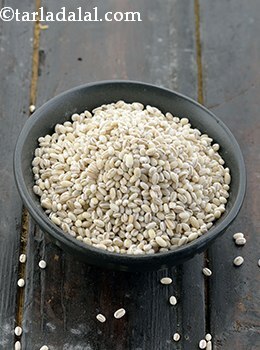 Barley Nourishing Soup is good for diabetics, weight loss and healthy living. The high insoluble fiber in barley helps you lose weight as it will combine with water and stay in the stomach for a longer period of time, making you feel satiated. Thus can be consumed as a wholesome and nutritious snack.